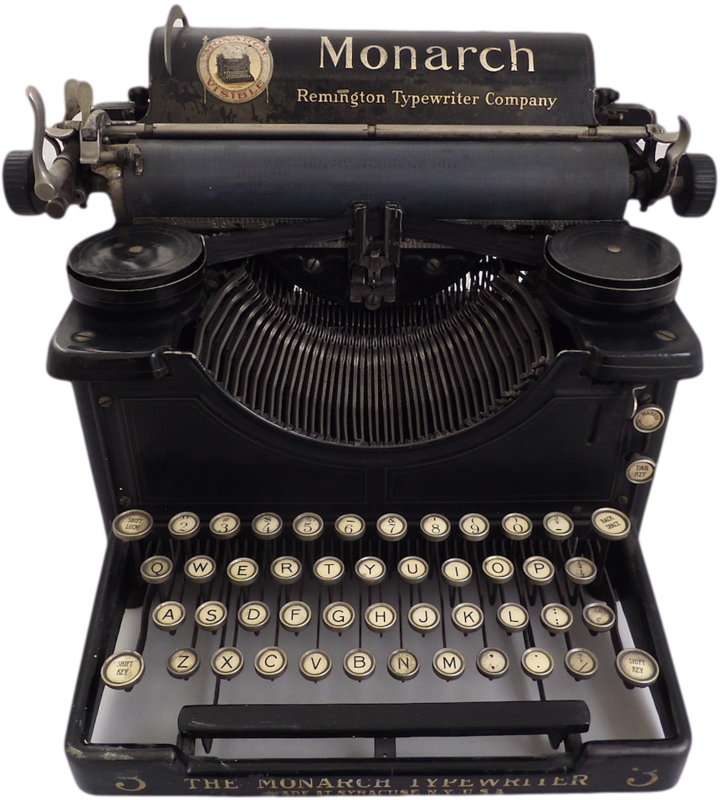 In reality, the Monarch was only an average typewriter, being neither remarkable nor unremarkable.2 It was a practical machine, achieving strong brand recognition, and its design endured for decades. 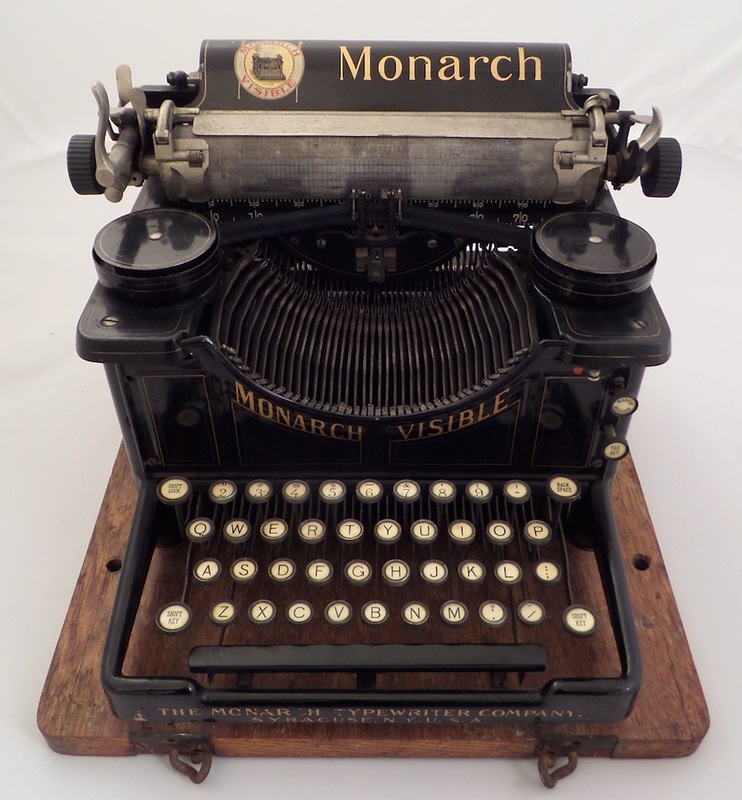 Thus, the Monarch occupies an important place in typewriter history. 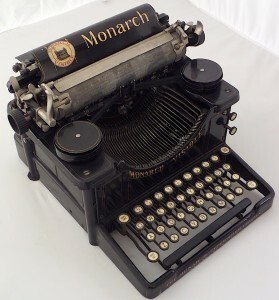 The Monarch Typewriter Company was founded in 1904 by the Union Typewriter Company,3 a gigantic trust that controlled several typewriter manufacturers, including Remington, Smith Premier, American Writing Machine (Caligraph/New Century), Yost, and Densmore.4 Each produced older-style, “invisible” typewriters well beyond consumers’ demand for such machines. 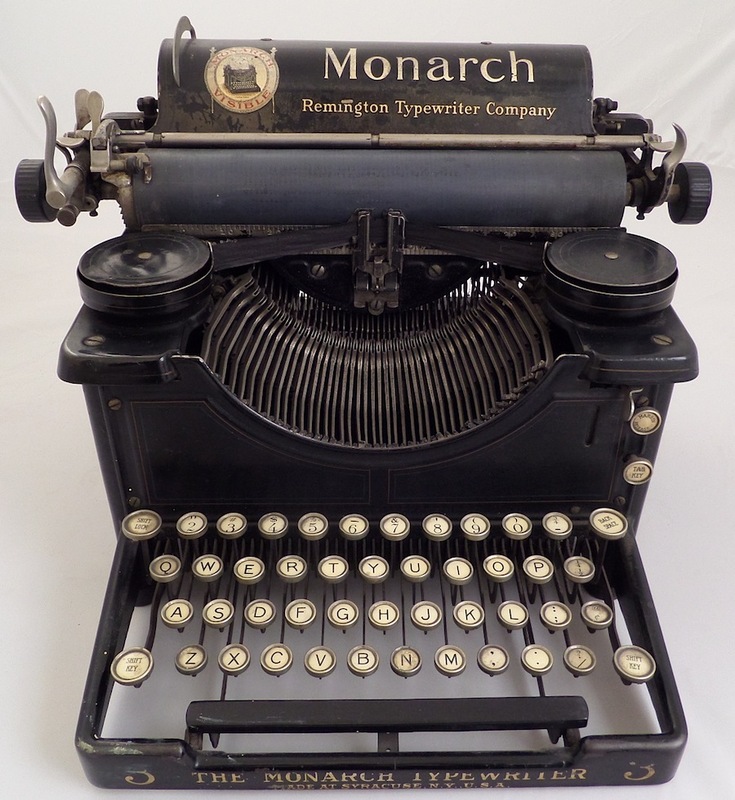 Belatedly, Union Typewriter responded by establishing Monarch, which manufactured visible machines. 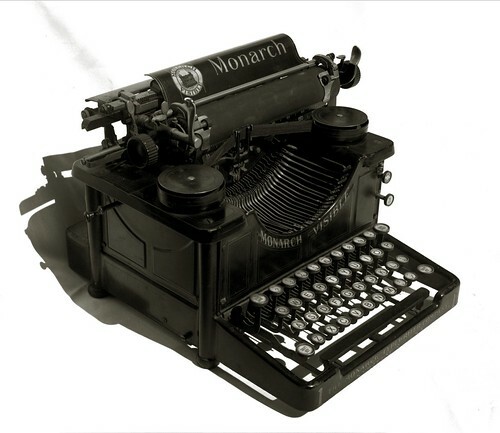 In 1905, Monarch was described as an entirely new company in the New York Times; no mention was made of its association with the trust.5 Yet, somehow, the Monarch came into its own, establishing itself as modestly competitive enterprise. For collectors, this creates opportunities for nuance. Not only were these machines marketed under different names, but with different labels as well — the variations are nigh innumerable. Lately, I’ve acquired two: a Monarch Visible No. 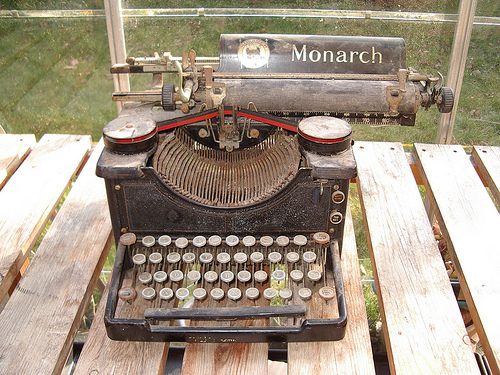 1 and a Monarch Typewriter No. 3, with Remington branding. These machines serve as the inspiration for this blog entry. 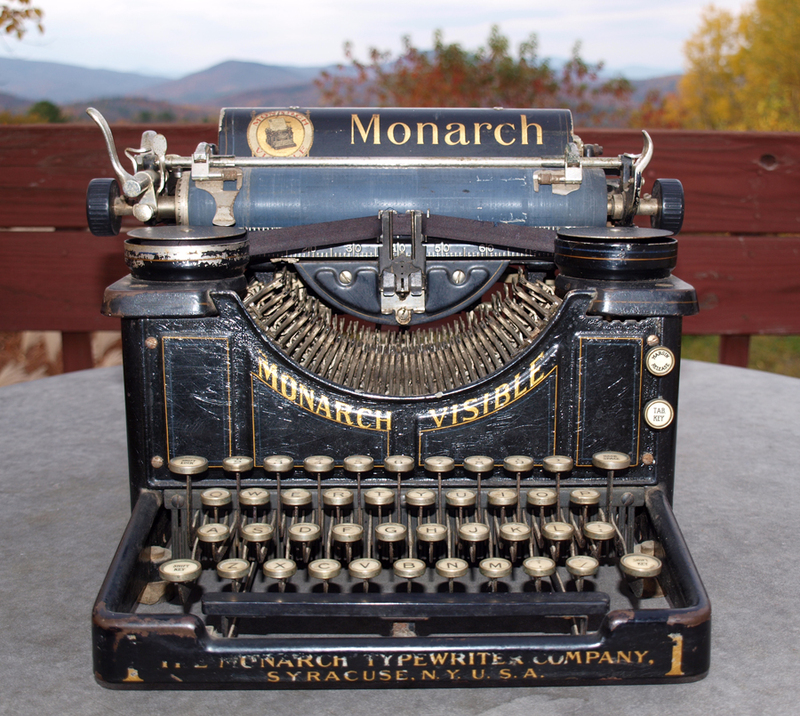 The label on the base of this machine reads, “1 The Monarch Typewriter Company ./ Syracuse, N.Y. U.S.A.” — partial loss on the first “1,” total loss on the second. 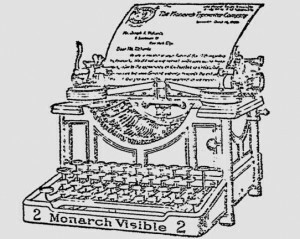 A curved label above the keys reads, “Monarch Visible,” indicating the typewriter’s most important feature: visible typing.7 The label on the paper table features the Monarch emblem and name. The serial number on my unit is 15177. According to TypewriterDatabase.com, this dates my machine to 1907, but that range includes the No. 3 — does it also include the No. 1? It’s possible that Monarch continued to produce the No. 1 beyond subsequent models, but that is not abundantly apparent. Will Davis notes that the earliest machine he has found is Richard Polt’s No. 2 (ser. no. 437). However, such a low number cannot account for the first Monarchs, which surely numbered greater than 400. Perhaps the No. 1 and No. 2 had different numbering schemes? Additionally, my unit was shipped with wood base and metal cover, though the emblem on the cover shows the Monarch No. 2. The image on the paper table is the No. 1. I do not know if the base and cover are original to my typewriter. The other cover I’ve seen shows a No. 2, as well. The mark of a No. 1 is its 38-key layout; subsequent models offered 42 keys. This is the keyboard on the Monarch No. 1, 38 keys. Will Davis’ Monarch No. 2, (see here). 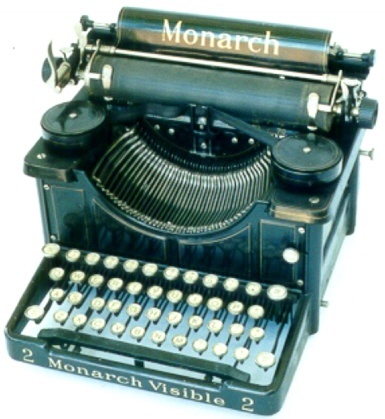 The second Monarch followed in 190510, including an expanded 42-key keyboard with many fraction symbols. It is otherwise substantially similar to the first model. Some No. 2s offer a tabulator and ribbon selector, others do not. This model was the last to represent the Monarch simply as Monarch. Subsequent branding would include Remington, and later Smith Premier. The No. 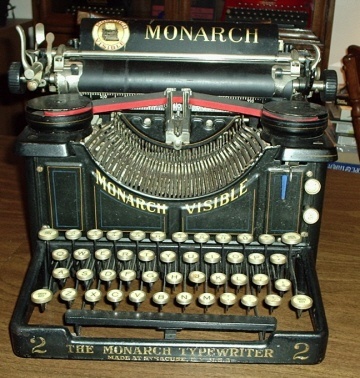 2 was branded as the Monarch Visible and sometimes as the Monarch Typewriter. (Presumably, the term “visible” was less impressive to consumers at this juncture as nearly all machines were now visible.) The No. 2 is more common than the first model. A similar image, but with different labeling, can be found here. It was advertised extensively in newspapers beginning in 1906. This image (left) was published in the Philadelphia Record, Oct. 22, 1906 (see full ad here). It’s obviously hand-drawn, as was the case in many advertisements. These images are simple, though not always representative of the actual specimens. In 1912, a factory rebuilt Monarch sold for $50 (see here). A particularly interesting advertisement is found here in a New Zealand newspaper from 1906. It states that “each machine is fitted with a tabulator attachment.” Were these machines modified by the distributor? Or was the tabulator a newly built-in feature? Finally, here is an image of a No. 2 with tabulator and ribbon selector from a 1909 advertisement (see here for full ad). 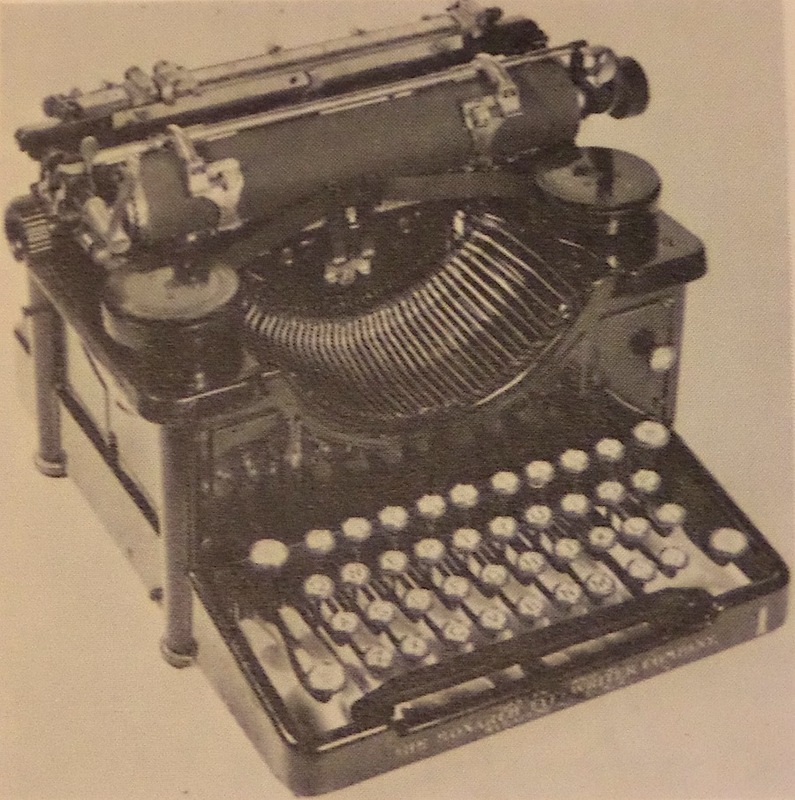 The tab key and ribbon selector were advertised as early as 1908 (see here). Since my No. 1 has a tabulator and ribbon selector, we can at least assume these features were offered as early as 1907. 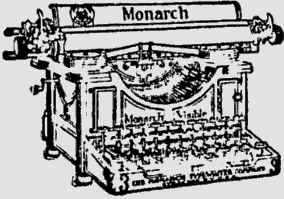 Gradually, Union Typewriter rebranded Monarchs as Remingtons, adding “A Remington Typewriter Company” to the paper table, before ultimately stripping out the word “Monarch” entirely. The No. 3 is similar to the No. 1 in design, though with many subtle differences, including the structure of its base. Developers seem to have found little to change in the early years. At this time, branding got convoluted: both Remington and Monarch were appealing names to consumers, and sometimes the brands were intermixed. Some No. 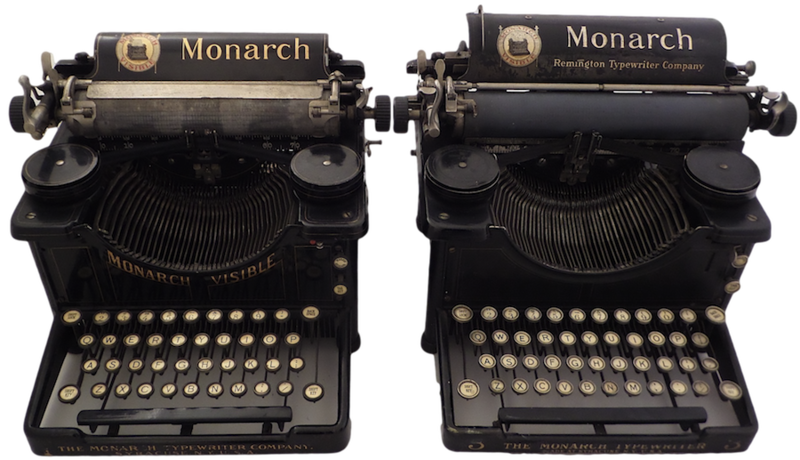 3s read, “The Monarch Typewriter Company,” while others read, “The Monarch Typewriter.” Gradually, Monarch was becoming less a corporate identity and more a brand. Meanwhile, the Remington name was featured more prominently. One interesting specimen of a No. 3 is held by the Powerhouse Museum in Sydney, Australia. Their machine is equipped with what seems to be an extended carriage. The serial number on that typewriter is 21134. See here. Images of No. 3s in advertisements reflect older labeling schemes. This image (left) is from the Ottawa Citizen, July 1, 1911 (see full ad here). I’ve not seen any No. 3 with this labeling (see below for labeling variations), but the image is hand-drawn and perhaps not representative of any actual machine. One notes it lacks Remington branding entirely (the ribbon lever is on the wrong side, too). Another non-Remington No. 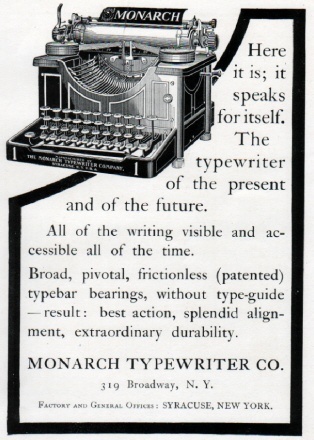 3 is found in this ad, though Monarch is listed as a “department” of the Remington Typewriter Company in the copy. Note also that the image appears to have been modified from earlier advertisements for the No. 2. Here is a summary of labeling variations for the models 1-3. I’ve documented nearly every example I could find on the Internet, offering pictures and links whenever possible. Serial numbers are provided when known. Note: In some instances below, pressing “here” calls up a fancybox popup. To view those images from the original sources, right-click and select “open in new tab.” Then, you will be able to view images in more detail. Featured in Beeching’s Century of the Typewriter, ser. no. unknown. 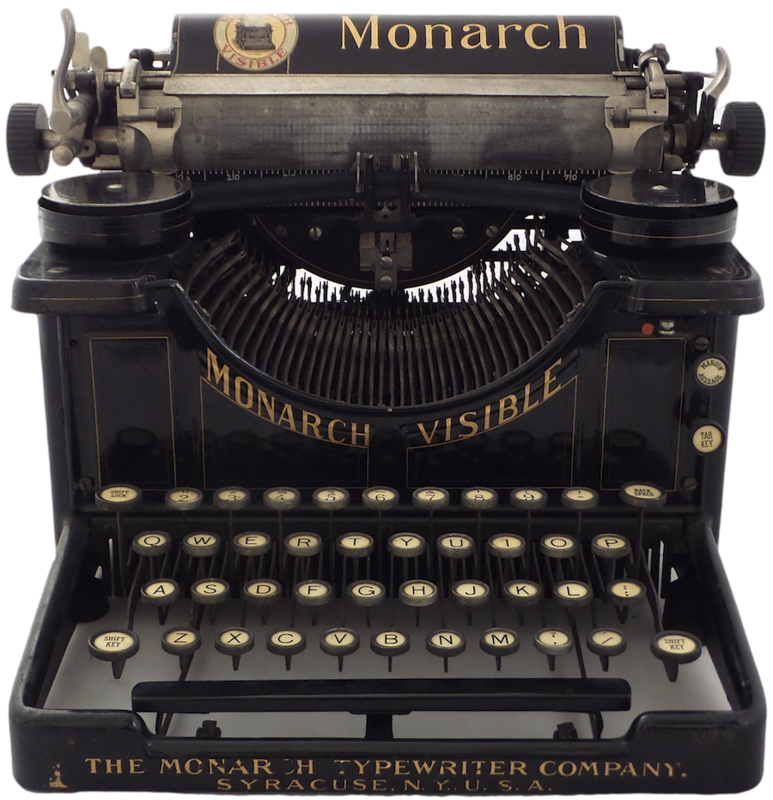 Sans ribbon selector and tab key, the basic 38-key model features the words “1 The Monarch Typewriter Company. 1/ Syracuse, N.Y. U.S.A.” on the base (there is additional text on the first line, but that text is illegible in photos). The phrase “Monarch Visible” is absent on the curved face plate. The Monarch emblem and name are on the paper table (apparent in advertising, see here). From my collection, ser. no. 15177. 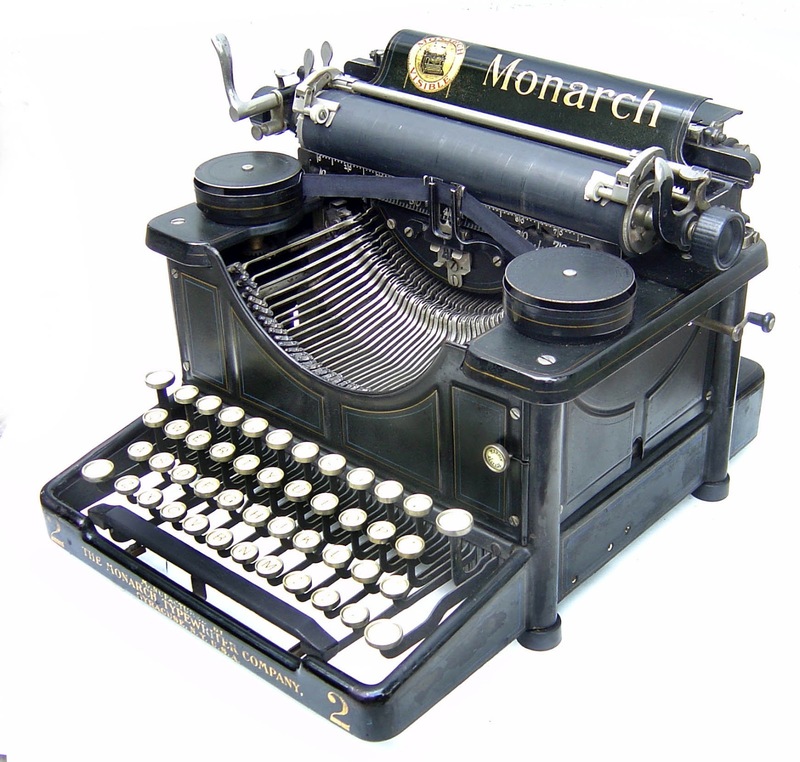 Including ribbon selector and tab key, the basic 38-key model features the words “1 The Monarch Typewriter Company. 1/ Syracuse, N.Y. U.S.A.” on the base — this text is wider than on the basic model. The phrase “Monarch Visible” is present on the curved face plate. The Monarch emblem and name are on the paper table. Steve Stephens Monarch, ser. no. 6719, posted here. Note that in the image above, the words “Monarch Visible” are not curved. Another basic No. 2 (ser. no. 1561) is posted here. 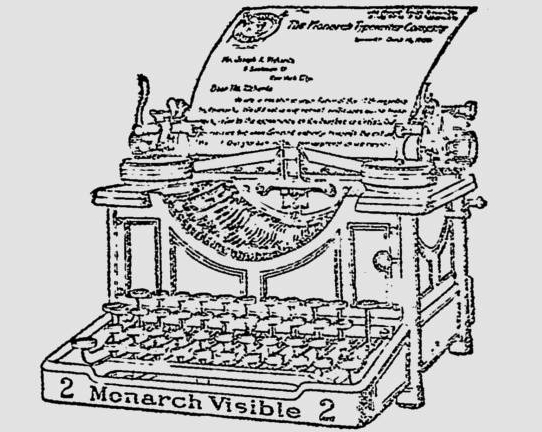 The text on the paper table, sans emblem, reads “Monarch.” The text on the base reads, “2 Monarch Visible 2.” There are no words on the face plate. Still another labeling version is seen here, this is Richard Polt’s No. 2 (ser. no. 437). Notice that the text on the base of this machine is narrower than other No. 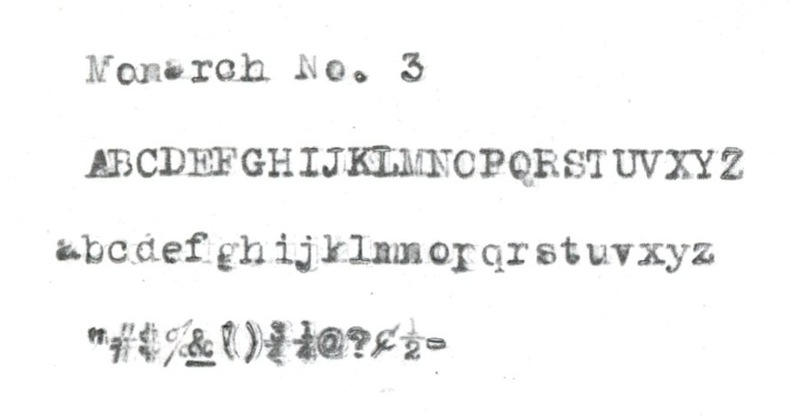 2s; it appears to feature three lines of text. Polt’s is also a basic machine. And yet another No. 2 (ser. no. 66988) is featured here. 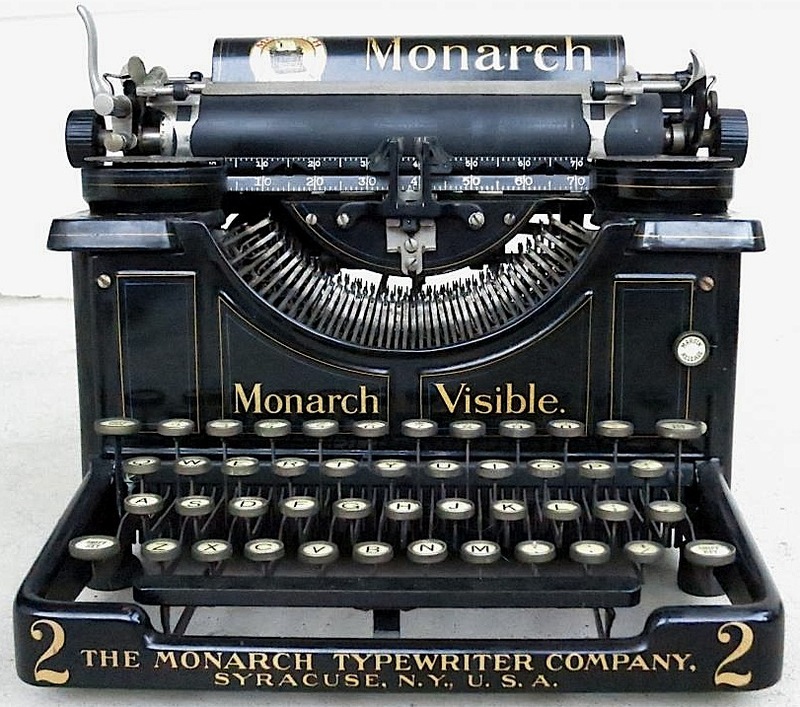 The words on the base read “2 The Monarch Typewriter 2/ Made in Syracuse, N.Y., U.S.A.” The words “Monarch Visible” is printed in curved text on the face plate. Notice that later No. 2s drop Monarch’s identity as a company. This machine includes ribbon selector and tab key. This is Paul Hollins’ Monarch, ser. no. unknown, found here. This is Stevetype33’s Monarch, ser. no. unknown, found here. Posted on eBay, ser. no. 102451. The machine above appears to be a No. 3. 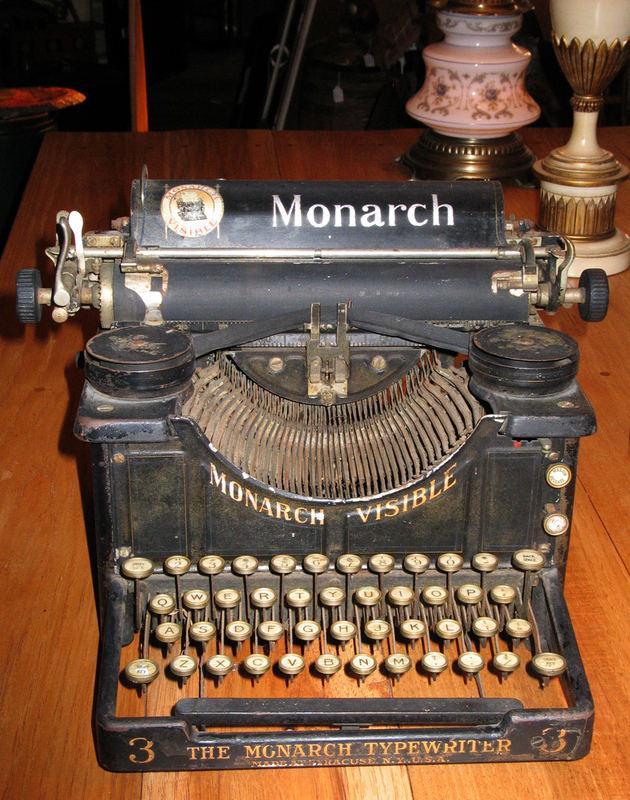 Notice the base reads, “The Monarch Typewriter Company.” Either this is a No. 2, with Remington branding, or it is a No. 3 that retains Monarch’s corporate identity. The serial number plainly dates it as a No. 3, though. From my collection, ser. no. 110097. No longer a “Monarch Visible,” this No. 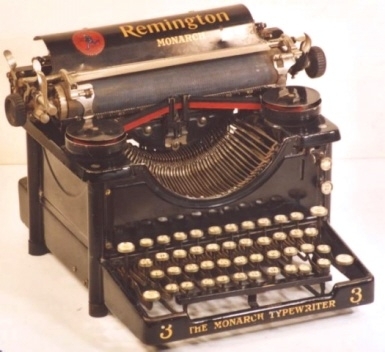 3 is a “Monarch Typewriter” with Remington branding. A number of similar specimens are posted at Will Davis’ blog here. One worth of highlighting, however, is this machine which gives first place to “Remington” on the paper table — see here. The serial number on this machine is M5 50451 and dates to 1915. Notice the numbering scheme has changed. 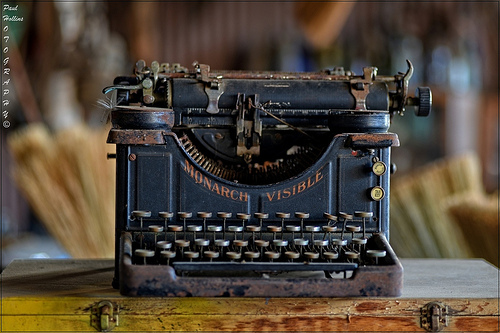 Update (10/23/13): Miguel Chávez writes about his Monarch No. 3 here. 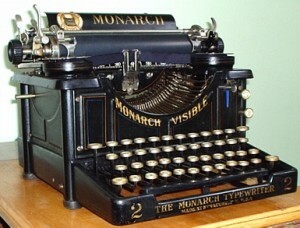 His lacks Remington labeling and features the words “Monarch Visible” in a straight line on the faceplate. Another, already mentioned, also lacks Remington labeling — see here or scroll up. My Monarch No. 3 at TypewriterDatabase.com. And the No.1 here. Another datapoint: I have a Monarch Visible No. 1, serial number 20698, with a tab key (The stops are missing. How many were originally supplied?) but no ribbon color selector that I can find. A very thorough report! This will be a great resource for future consultation. Thanks, all, for the comments. Much appreciated. Michael, if you send a photo or photos, I will add (netadams @ gmail). Richard, what do you make of the serial numbers? Different numbering schemes? Or, did Monarch make the No. 1 and No. 2 concurrently? So far as concurrent production of No. 1 and No. 2 machines is concerned, it’s my belief that this was the case. Mares mentions release of the Monarch in Autumn 1904 in the United States and Spring 1905 in England, and shows a No. 2 machine. The juxtaposition was just like that between the Underwood No. 4 and No. 5, with the lower model- numbered machines being the less expensive ones. 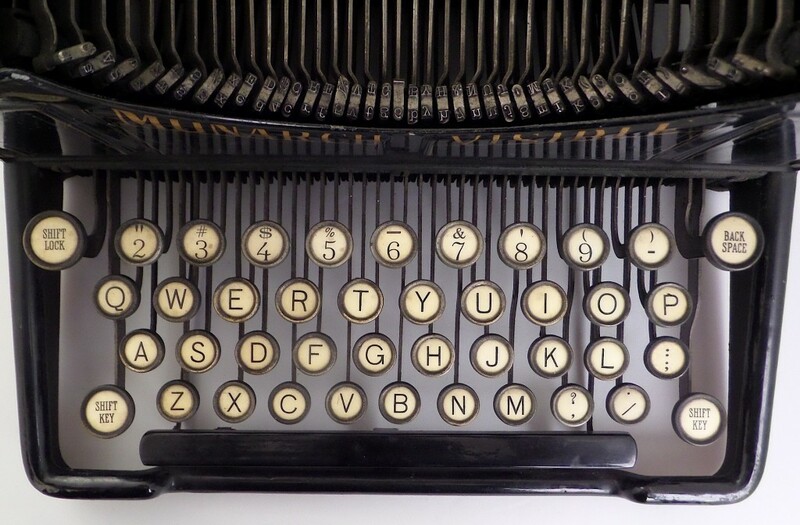 There’s a model 1 with ribbon selector tab & backspace key, sn 48731, offered on eBay now. This would suggest that, much like Royal, which produced the 1 and 5 at the same time, Monarch did the same with the 1, 2, & 3. I think for a period they did, but that is not very evident from advertising. We have a Monarch Visible that has been repainted green and rebranded as a Remington Standard. Remington is written on the paper plate and Standard on the front plate. The words Monarch Visible are noticeable under the green paint. It has a serial number 33630. It belonged to an Uncle from Kalgoorlie WA. Would love to see a photo. If you send images to netadams @ gmail I would like to post here. I have a Monarch 3 Typewriter with the serial no. MK60594. Would anyone know approximately what year this would’ve been made? 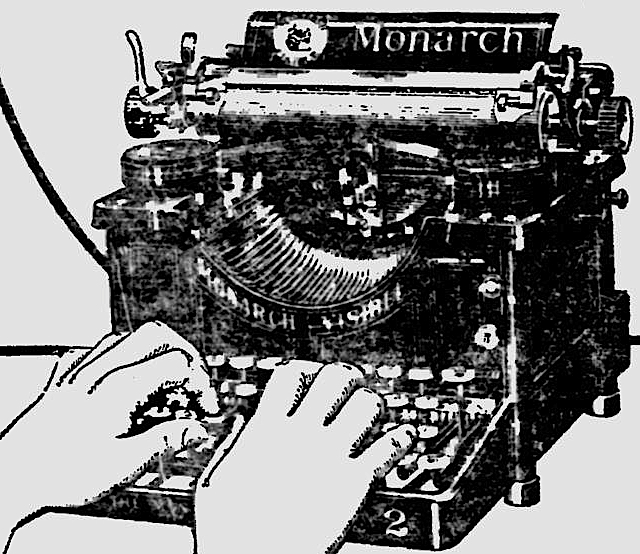 The text on the front paper table displays “Monarch” with their Monarch Visable logo to the left. 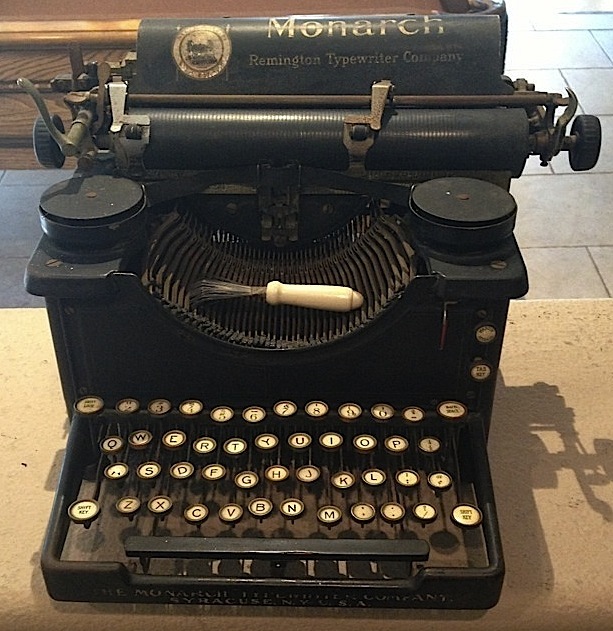 There is no wording of Remington on the typewriter and there are no words on the face plate. 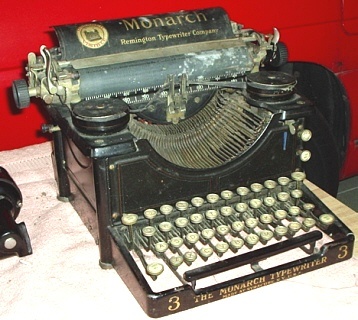 The text on the front base reads “3 The Monarch Typewriter 3”. On the back bottom base is written “Monarch Made at Ilion, New York, U.S.A”. I think my monarch is a number 1 but have to go underneath and check the Serial number and some other stuff. It has been in storage for a long time but I noticed you had asked how much they were worth. Did you get an answer? This was my mothers typewriter when she worked at a Western Union office here in Souther Calif. Send an image please: netadams (at) gmail.com. It’s likely the machine was made in America, but labeled for sale in Canada. Thanks for sharing.